No one wants to peak early in life; and everyone wants to believe their best years are ahead of them. As for this 1971 Ferrari 356 GTB/4 Daytona NART Spider by Michelotti, its best years—from a desirability standpoint—are likely just beginning. Built as a standard Daytona for the American market at the onset of the 1970s, the car was equipped with factory air-conditioning and power windows, but it was re-bodied five years later by Giovanni Michelotti, at Ferrari North American Racing Team owner Luigi Chinetti’s request (hence the NART designation). It is one of five open cars that feature a single, uninterrupted beltline from bumper to bumper, and an angular, shark-like nose. A 1971 Ferrari 365 GTB/4 Daytona NART Spider by Michelotti Photo: Courtesy of RM Sotheby’s. The 1972 Intermeccanica Italia Spyder presented by RM Sotheby’s. Photo by Gabor Mayer, courtesy of RM Sotheby’s. The 1974 De Tomaso Pantera L by Ghia that sold in Scottsdale. Photo by Peter Seabrook, courtesy of RM Sotheby’s. When Ferrari unveiled the 365 GT 2+2 at the Paris Auto Show in the fall of 1967, the tourer attracted attention thanks to its body styling, which echoed the brand’s 500 Superfast, not to mention a bevy of new standard features, like power steering, air conditioning, and a four-wheel independent suspension. When this particular example, a 1970 Ferrari 365 GT 2+2, crossed Gooding & Co.’s auction block in Scottsdale, it again attracted plenty of attention since the car had spent the previous 24 years hidden away in the consignor’s heated garage. The 1970 Ferrari 365 GT 2+2 presented by Gooding & Company. Photo by Brian Henniker, courtesy of Gooding & Company. 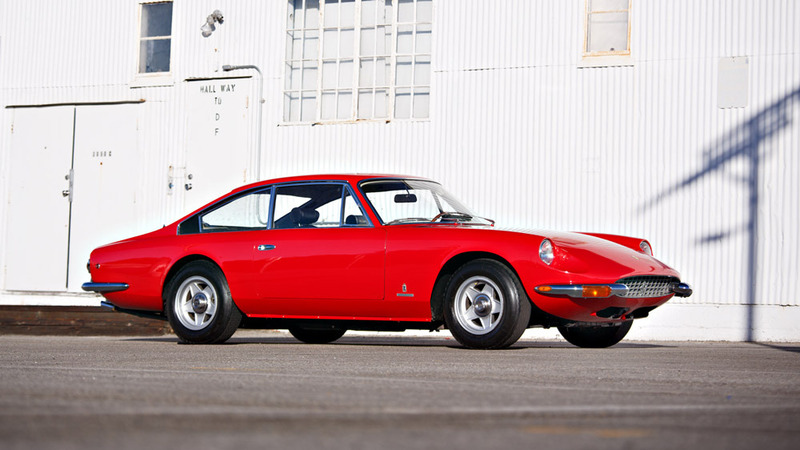 The 1972 Ferrari Dino 246 GT that sold through Gooding & Company. Photo by Mike Maez, courtesy of Gooding & Company.